How to install KidLogger application to your PC? Download KidLogger monitoring agent from Download page of the site. Unzip the package. Make a right-click on the package and select "Extract all.." command. Run install.exe as administrator(perform right-click and select Run as administrator). 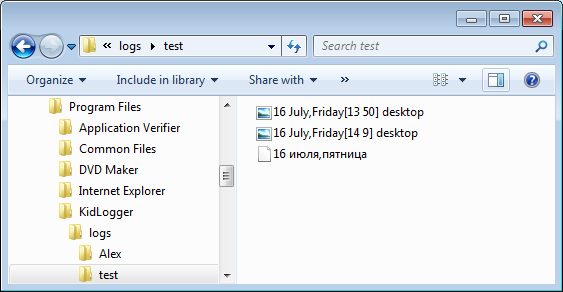 Open KidLogger by selecting it from the Start Menu or Desktop(Run as administrator). On main window select users, you want to monitor. Click Options in the program's main window. On tabs General, Sound recorder, Screen capture select the type of activity you want to track. Now monitoring of target computer begins. How to connect KidLogger application to your account on KidLogger.net? Connecting KidLogger application with your account on KidLogger.net allows to view all user activity online on KidLogger.net and also generate various reports on User Activity. Please note: when the application is connected to KidLogger.net it will upload all activity journal and screenshots to KidLogger.net storage allocated for your account and accessible only by you. Register your free web account on kidLogger.net. Launch KidLogger application on target device as administrator(Right-click on its icon->run as administrator). Click Options in the program's main window --> open KidLogger.net tab. Choose Connect to your Kidlogger.net account. In the field Enter your e-mail or device ID enter the e-mail address, you used for registartion. The server will generate new device ID, which will be automatically inserted into this field. To connect KidLogger application to existing virtual device, insert its device ID into the field. Press Connect to account. Login back to your KidLogger.net account and watch the data. If you want to rename the the device, click on icon with a pencil, but don't rename the ID. How to locally view Log and screenshots on target computer? Click "Open log folder" to see screenshots for each day. Log files are separated by date. They can be HTML files, mp3 files or screenshots. KidLogger creates a separate folder for log files of each user account. This logger presents logs in a user-friendly manner – HTML files. KidLogger folder with user accounts and activity history. - Log files and screen captures may take up to 200 Mb of your disk space. How to upload the data from different users of a single computer onto different virtual devices on server? Log in your Windows user profile. Launch Kidlogger application as administrator. In main window, select desired users. Open Options, and uncheck Log any user on this PC in first tab. Assign the password for control panel launching. If you need to monitor the current user too, select Connect to your Kidlogger.net account on Kidlogger.net tab and write your e-mail address into Your e-mail settings filed. Click Connect to account. The new virtual device will be created in your personal account on Kidlogger.net server, with the name of current user. Restart the monitoring in main window. Log out your Windows account and log in your child's account on this computer. Desirable, it not to have administrative rights. It prevents your child to uninstall Kidlogger application. In child's account launch KidLogger application ordinary way, not as administrator. Open application options and, in Kidlogger.net tab, into Your e-mail settings field fell-in your e-mail address again. Click Connect to account. The new virtual device will be created in your user profile on Kidlogger.net server, with name on your child. Log out and do the same for all user accounts of your children. How to hide KidLogger monitoring app? Open KidLogger application and click "Stop logging"
Delete 'Kidlogger' folder from the registry: HKEY_LOCAL_MACHINE\SOFTWARE\KMA7 or HKEY_LOCAL_MACHINE\SOFTWARE\Wow6432Node\KMA7. To make it invisible in Uninstall list - delete Registry Key: HKEY_LOCAL_MACHINE\SOFTWARE\Microsoft\Windows\CurrentVersion\Uninstall\KidLogger_is1(Monitoring_agent_is1). On 64-bit system find HKEY_LOCAL_MACHINE\SOFTWARE\Wow6432Node\Microsoft\Windows\CurrentVersion\Uninstall\KidLogger_is1. Copy the folder "c:\program files\KidLogger" into another folder, but not on system disk. You can rename the folder too. Restart the computer, Delete :\program files\KidLogger folder. Now open copied folder and run renamed exe-file again. Configure the application again, and press start monitoring button. 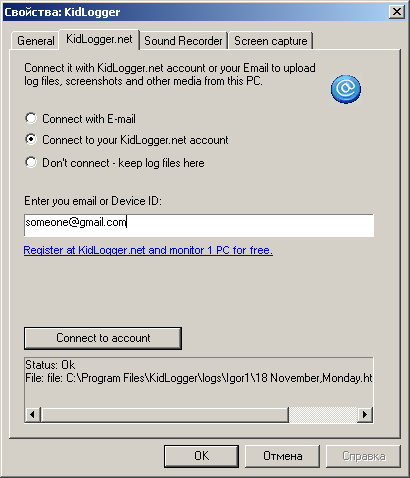 For users, who have Professional account, is possible to download and install Kidlogger PRO for Windows. 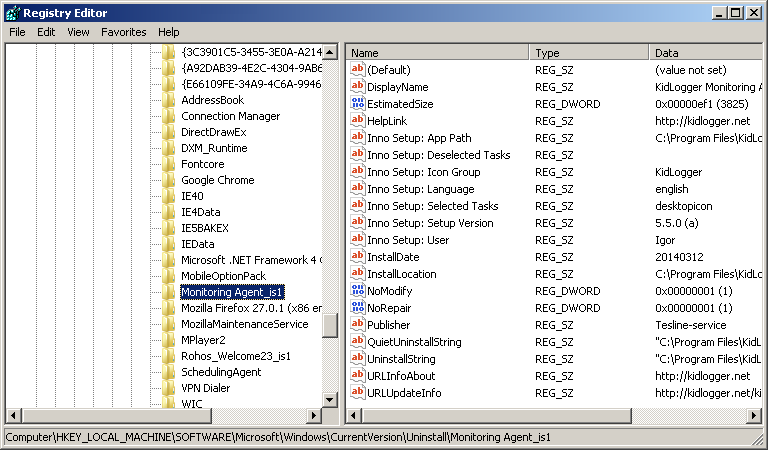 In this application all settings are already configured for hidden monitoring. Read more..
Why some Antivirus software detects KigLogger monitoring application like spyware? How to get rid of this issue? 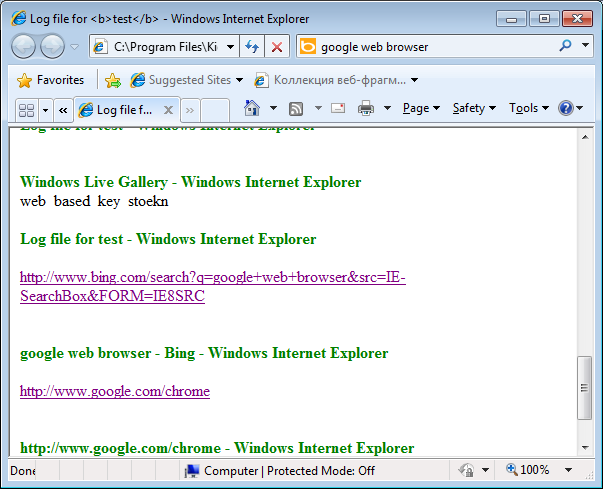 KidLogger is detected by some antivirus software like spyware or malware. Spyware and monitoring application seem to have much in common, since both softwares deal with recording user activity on a computer. But KidLogger is not a spyware, and the overall user activity log is kept on KidLogger server in perfect security and is accessed and used solely by registered members for their own needs (and as it has been stated in previous sections, this software is intended only for legal use). So, if you face the issue when your antivirus software detects KidLogger as spyware or malware, go ahead and change the settings in your antivirus program (list it in exceptions/search in Google how to do it). How to uninstall the application from a PC? First you need to stop the monitoring. Launch the application and click on Stop button. You can as well start Task Manager, find Kidlogger process and stop it. After that launch Control panel, Uninstall a program, find the Kidlogger in application list and click on Uninstall button or link. In Windows 10 you can find KidLogger in Start menu and perform a right-click on it. Choose Uninstall command from context menu. How to delete portable KidLogger? Find process named "Explarer" and End this process. 2. Delete kidlogger portable files.